"The quality is just incredible," said Butoryak. Hamot Medical Center is committed to providing outstanding patient care in an efficient and cost-effective environment. In fact, staff describe the Erie, PA, hospital as among the "best wired" in the country. The Radiology Department, which for years has claimed the area's only PACS, helped solidify that reputation. So when the department's dry imager began malfunctioning, resulting in downtime that staff could not afford, it left those in charge wondering how best to resolve the dilemma. They solved it by acquiring a Horizon® Ci Multi-media Dry Medical Imager from Codonics. "Size was a concern, because our previous system was large and took up considerable space in our department," said Betsy Butoryak, Supervisor of Radiology Support Services. "However, service became the bigger problem - it never seemed that we received service as fast as I needed it. When the imager was down, there were instances when we had to print images onto plain office paper before we switched over to the Horizon." She added, "When you're talking about CT scans, and you're giving doctors images printed on 8.5" x 11" plain office paper, it's not an optimal situation." Hamot Medical Center is a 343-bed hospital operated by Hamot Health Foundation and staffed by 2,880 employees and 459 physicians, 13 of them radiologists. The department completes an estimated 130,000 exams annually, nearly two-thirds of those involving general radiography and the bulk of the remainder - about 35,000 - CT exams. The department uses the latest technology to ensure that diagnoses are as accurate as possible. In addition to general radiography and CT, the wide range of imaging modalities available includes mammography (the hospital will soon offer digital mammography), MRI, nuclear medicine and ultrasound; interventional diagnostic and therapeutic procedures also are available. Hamot has made a significant investment in technology in order to provide those services. That investment includes the Horizon Ci Multi-media Dry Medical Imager, which the Radiology Department manager and several technical managers "discovered" during the 2005 Radiological Society of North America Scientific Meeting, where Codonics demonstrated it. They returned home with exciting news of a breakthrough imager that presented on grayscale and color paper as well as film. Butoryak considered the system seriously, visited the Codonics web site for additional information, requested a demonstration, and was extremely impressed with what she saw. The imager was installed in December 2005 and is used primarily in conjunction with CT and radiography as well as MRI and ultrasound. "The images are so clear, so easy to see, and the imager is much less expensive than our previous one - and cheaper to operate as well," said Butoryak, adding that a second imager was purchased for a freestanding imaging center recently opened by Hamot. "We are saving 60 cents a sheet over what it was costing us to print film, which is a huge savings." That, combined with purchase and maintenance costs of their old system, resulted in a $25,000.00 savings overall. 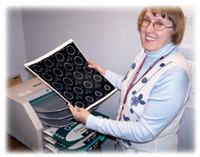 Using the Horizon Ci Multi-media Dry Medical Imager, diagnostic-quality images are presented on clear and blue film, grayscale paper, and color paper in various sizes. The Ci generates 14" x 17" and 8" x 10" blue and clear film; low-cost grayscale paper prints in 14" x 17", A and A4 letter sizes; and color in A and A4 sizes. The Horizon family also includes the Ci-s, the GS, the GS-s, the XL and the SF, which have various blue and clear film, grayscale paper and color paper capabilities. The Ci is among the most popular of the Horizon models because it offers the most versatility. At Hamot, most images are presented on low-cost 14" x 17" DirectVista® Grayscale Paper, but for those physicians who still prefer to see images on film, Horizon easily accommodates those preferences. Over the next year, as the department increases the number of CT perfusion studies it completes, the imager is expected to present an increasing number of images onto ChromaVista® Color Paper. In addition to stroke and cardiac perfusion studies, the imager presents spinal studies especially well. Its use in the evaluation of stroke patients is expected to grow as that effort expands. Additionally, interventional radiologists who were printing CT perfusion studies onto plain paper have raved about the images they're now seeing in vibrant color. About 10 CT perfusion studies per month are being completed, a number that is expected to increase as the hospital implements its stroke protocols. "The quality is just incredible," said Butoryak. "The detail is unbelievable, our staff on the floors love it, and we'll probably be using the color paper more and more as we get increasingly into cardiac and stroke procedures. We're now getting the equivalent of photographs, where before we were getting drawings." The grayscale paper images presented using the Horizon Ci Multi-media Dry Medical Imager are particularly useful to referring physicians. Because the images can be viewed in room light, referring physicians can evaluate them anywhere - even in the comfort of their homes. Patients, too, are impressed by being able to view the images, and discuss their diagnoses in a well-lit physician office. "We have a specialty physician group that is very particular, and when we first began evaluating the Horizon we printed onto both film and paper for them," Butoryak said. "They were my litmus test - I figured if I could get them to sign off on paper, then everyone would. They had no problem switching over." The grayscale images also conveniently guide surgeons in the operating room, and those transmitted via the PACS can be printed from the department's technical area for presentations and other uses, with an image quality equivalent to that of film. Thus far, a notable savings has resulted from the switch from film to paper. In 2006, the department has printed more than 20,000 images onto paper, saving about $12,000. Annualized, the department expects to save more than $15,000 this year. "The big savings involves productivity. I no longer have the lost productivity that we were seeing when our other imager was down, or the repair costs that go along with it," Butoryak said. "The Codonics imager is always up and running." She added, "It's very important knowing that if the imager were ever to go down, I'd get a replacement unit almost immediately. It gives me great peace of mind knowing we wouldn't be down for a week like we were with our previous system." Additionally, the Horizon Ci Multi-media Dry Medical Imager has enabled the department to eliminate an 8-foot x 8-foot space that the old imager used for film storage and disposal room - Horizon's footprint is comparable to that of a conventional office printer. That room has been converted to office space, facilitating added productivity. Space aside, the Horizon Ci is improving workflow, printing images five seconds faster than the department's previous printer, making a highly efficient department even more so. "We love the images, but we also love the convenience of paper and the option of presenting onto film," Butoryak said. "In only a matter of months we've saved thousands of dollars, increased the speed of our exams, freed up space, and made both our physicians and patients happy. In radiology we don't like downsides, and with the Horizon Ci there's really no downside at all."